Motherhood changes us. For better or for worse, we become physically different versions of ourselves when we become mothers. We quickly come to realize that babies do not care if we are showered, dressed, or made up with cosmetics. In fact, they probably like us better when we’re snuggled in with them, smelling earthy and feeling soft. That’s all fine and good for a little while, but then we need to make our way out of our domestic cocoons and into the world of functioning adults. We have to work, shop, keep appointments, and–oh yeah–socialize. In most cases, the women I know make this transition pretty well and put themselves together a bit to go out in public. Nothing fancy–just a little mascara and clothing that doesn’t include flannel pants with a drawstring waist. It’s not necessarily easy, but we can make it happen. I absolutely do not pass judgement on women who go out in sweats and bare faces because I know how difficult it can be to put together an outfit with a screaming child (or children) clinging to you, overflowing the toilet, vomiting on the dog, or whatever. Normally, though, I’m not one for sweats. Why did that have to be such a back-handed comment? I’m not that put together…I think there’s a coffee stain on the front of my shirt. She probably doesn’t have kids, and thinks of dogs as babies. Did I brush my teeth this morning? Now, let me ask you…why is that? Why do people automatically assume that because women have children (or, at least, more than two children) we’re supposed to be perpetually disheveled slobs? 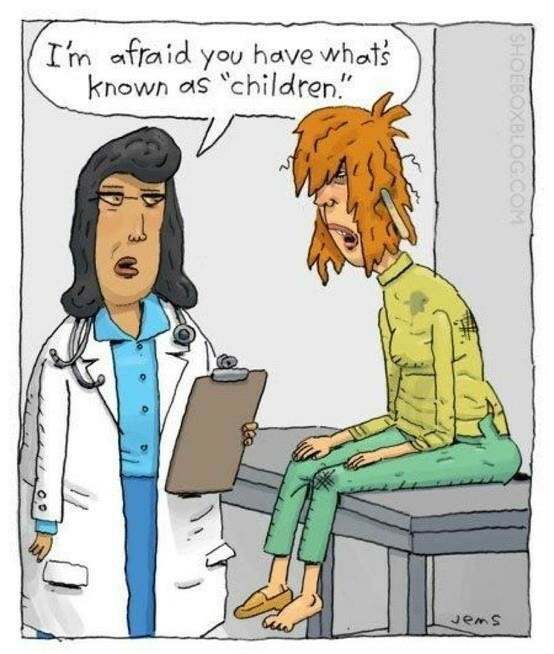 I will freely admit to wallowing in my slovenly condition when I had newborn nursing infants, and going out in public looking like I hadn’t slept in months–because I hadn’t. But, really, when does it stop? My youngest is now seven years old. What would make that woman think that I am unable to pull myself together enough to meet some friends for coffee? It was a school day, for God’s sake!